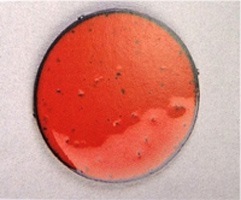 Why are opaque red, yellow and orange enamel full of black spots? Why are opaque red, yellow and orange enamel full of black spots and lacking in colour? Why are opaque red, yellow and orange enamel full of black spots and lacking in colour? These enamels can prove to be the most difficult to use, these colours are highly sensitive to temperature and firing time due to them containing cadmium pigment. The slightest amount of over firing will cause problems. If you are using a kiln, reduce both the temperature and firing time. 780°C for 2 minutes is a good starting point. If using a torch, stop firing as soon as the enamel has melted. If you are doing multiple colour/firings use the opaque red, yellow or orange only on the final firing.